I stumbled upon your site while looking for information about the Avalon Theatre. Browsing through your photos was a trip back in time. You lived at 7904 Essex Ave.; from 1950 until 1957 I lived at 8104 Essex! Sadly, to visit that neighborhood today might cost one their life. John is doing such a great job and bringing back memories I also grew up at 8029 Escanaba. granduated from South Shore in 1956. So long ago but all my friends ( who are not in the sky) still get together even though we live far away from each other. Awesome site with many memories rekindled. Our family lived @ 7307 S. Merrill and moved to South Florida in 1968 after graduating from St Phillip Neri and attending Mt. Carmel High School. Went back to the neighborhood in Jan of this year, always fascinating. Thanks very much for your work here! And thank you, Tom, for the very nice words. Always nice to learn how the images have a good deal of meaning for others. hi John…i too found you through your south shore photos….i lived at 7742 S. Essex from 1950 til 1964 and graduated from South Shore in Jan. 1961….they are planning their 50th reunion for next year. did you go to So Shore or Bradwell? 7904 Essex…was that above the Alpert’s deli? I went to Bradwell (from 5th grade), graduating in 1959 and South Shore, graduating early (from summer school) in 1962. And yes, indeed, that was above Alpert’s Deli, a place to which I paid more than a few visits. I can still remember seeing from the backporch old Alpert with his hands on his hips and a white apron in the gangway behind the stores. Thank you for your enlightening memories, that I too share. I graduated from SSHS in 67′ and also went to Bradwell. Ahhh, such sweet memories. I have revisited the South Side and so enjoyable, I wanted to go everywhere. My dad owned Barr Bros. Service Station on 75th Street (was next to a children’s clothes store called Anabelle’s (I think)………there was a drug store across the street. Was that the service station at Colfax and 75th? There was a small drug store across Colfax on the corner. If so, I lived on the top floor of the apartments just the other side of 75th. thank you so much for all those memories and beautiful pics of SS! I lived at 7940 Kingston and graduated from Bradwell at 1964. Sadly my parents/family went back to Germany in April 1964 and I am still homesick after so many years. What a wonderful urban neighborhood it was. Gordon’s Pet Shop, Cunis, White Castle…. I used to take part in the Yoyo contests which were held just across the street of White Castle. There was a newsstand on the corner with an old man selling the latest news. Used to go fishing on that 79th Street pier and bought my bait at that bait shop near Alexander’s Steak House. I loved Rainbow Beach and spent almost all summer there. What a great time, what memories. Thak you so much. Perhaps this lovely neigborhood will revive again. Tried to get in touch with old classmates but it seems as if evryone has gone. All the best and keep posting! And thank you for such a wonderful comment. Your South Shore address was just a little south of Preston Uney’s house – first house on the south side of the alley, east side of Kingston – a humble little place covered with Insul-brick siding, now gone. South Shore was a special place in which to grow up, but it was also the time. Few play with yo-yos today, and Americans have grown to think they are entitled to three-car garages. I remember all the things you mention, but I had forgotten the newstand. Caryn’s father was the owner of the toy store near the Avalon Theater. She wrote a book about his being murdered in a robbery (after my time). She runs a monthly newsletter, and she will gladly add your address to her distribution. It goes to over 2000 old South Siders. She inserts contact requests in the newsletter. If you search around on the Internet, you will find a number of various Bradwell and South Shore Re-union sites with pictures and contact addresses. Caryn specializes in information on these too. Ruediger, I welcome copies of any old snaps or memorabilia to include on the site. Just send a photo or scan as a jpeg. Found your blog and was interested because my dad owned Al’s Delicatessen on 75th Street. Thanks for the photos. I remember buying, at various times, pretzels (the fat salted sticks from a plastic drum on the counter which I believe were two for a penny), onion rolls (I think five cents), potato chips, and candy in your dad’s store. We knew each other by sight. There used to be a large billboard on the Colfax side of the building. I remember it advertising Canfield’s 50-50 soda pop at one period. Do you happen to have any pictures of your dad’s store or the immediate area? I’d love to post anything of that nature so long as the image is reasonably clear. Thanks, I found a photo of a Chief Wash laundry truck of Chicago through google, I drove one of those trucks in 1954, my route was the North Shore,in Wilmette,Winnetka,kenilworth areas, one of my customers was Jack Brickhouse, the radio announcer . Always nice to receive these little anecdotes. Tears in my eyes. This is a gift. I lived on 77th and Coles, 79th and Essex, 78 and Bennett and 76th and Coles. I went to Bradwell and SS. Do you remember Ray’s Pizza at 76th and Coles? I’d watch him in the window making pizzas (80 cents for a small cheese) and he’d sweat. That’s probably the secret ingredient that made them so good. And thank you, Lita, for a lovely comment. Do I remember Ray’s Pizza? Bill Hachmann and I, going to Troop 594 Boy Scouts on Friday nights at Windsor Park Lutheran on 76th, sometimes split a pizza there for dinner. That was always a special treat. Cheese was my favorite, though any were good. Any snaps or items of interest you would like to see displayed, just send me a scan or image (j-peg) at jc60649@yahoo.com. If it ‘s of any general interest (even a background or portion of a notable place), I’ll be glad to post it crediting you. Hi John. I happen to be a student of So Shore also.. and I fondly remember that charming Lita Skinder. Surprised we never met in the old neighborhood…( I was born at 75th and Coles and lived at 76th and Saginaw from 1953 till 1968). Tripped across your photos on South Shore newsletter and brings back great memories. I now live 1.5 hours north of Rainbow Beach and I try to get there each summer. If you need any updates on photos, I’d be glad to document. Thank you,thank-you, Chuck I grew up at 89th and Constance, but your pictures and words brought back so many memories of places I knew and loved and growing up. I was especially taken with the picture of the library on Kingston where my mother took me when I was six to get my first library card and my first library book. Our Bowen HS reunion was this summer, followed by a high school girlfriends reunion in Tucson a few weeks ago. What a great place to grow up, with the best, friendliest people. PS. I remember Mitchell’s Ice Cream Parlor on 71st street with the most amazing hot fudge sundaes and caramel candies, and kind of glum waitresses. Nice to hear from you, Denise. It was a wonderful place and time in which to grow up. Even for those who were not well-off, the entire neighborhood was like a big wonderful playground, full of interesting things. Just found this web site reading all the comments bring back old memories does anyone remember Gino’s Ice Cream Parlor 79th near Muskegon or Swede’s were we all hung around or Jack’s on 75th near South Shore I lived at 8029 Escanaba. Graduated 1956 and still have my friends from the good old days.I cann’t believe I moved so far away Grayslake il.Thank you for your blog. I don’t recall your other places, but Jack’s on 75th was in the corner of the building where we first lived in South Shore. I bought many an onion roll or pretzel there. Perhaps you knew Karen Matthews who lived on Muskegon Avenue. She has a couple of photos here. Perhaps my sister will remember your brother or you when I show her your website. I collect pieces of dinnerware from the South Shore Country Club on the little cove between the Golf Course and Rainbow Beach ~ energy filled with happiness cupped in my hand. I had to move back in 2007. I had to breathe the Lake air and feel the sands of time under my feet. Your treasured website only enhances my father’s memory from 1906 to today. Thank you for the echoes heard in the halls of Bradwell. I will share the magic you have put here. 7th grade at Bradwell graduating in 1953. We moved to 81st and Colfax and I graduated from South Shore in 57. We weren’t living on Essex when you moved in but the building is just like I remembered. I can’t wait to share these with my kids who never grew up in Chicago and my 95 year old mother who remembers the Bon Ton well. Thank you! Thanks, Roz, for your comments. Enough of these builds a web, so to speak, of relationships, a personalized picture of the community of South Shore. My parents raised four children (2 boys and 2 girls) in the 60’s and 70’s in a different area of the SouthSide of Chicago (Beverly). My mother grew up in SouthShore and lived on Jeffrey. She recently sent me a link to your website so that I could sneak a peak into her childhood and where she grew up. I never realized how beautiful this neighborhood was and I’m ashamed to say that I grew up in Chicago and never experienced any of the SouthShore until now. The architecture and the wonderful insights into what things my mom experienced growing up in this lovely area were truly amazing. Sorry to wax nostalgic, but the older I get, the more I try to get to know who my parents were and what their lives were like before they became “parents”. This site most certainly gave me that and much more! Thank you so much for what you bring to all of those that view this site! Thanks for the kind words, Jean. I think we all share the wish to know a bit more about our parents’ lives, especially as we grow older ourselves and appreciate what it is to raise children. I am very pleased that readers find many different thoughts and memories to embrace on the site. Great pictures of a great place to grow up….got my first kiss at Avalon Theater. In the Vintage Toronto Postcards Volume 3 you have a picture of TTC car 1522 identified as a Peter Witt car. 1522 was built, in 1911, by the Toronto Railway Company. It was scrapped in 1940. I grew up in “Bush” area of South Chicago from 1961-1974. That was an area from 83d st to 85th (north to south) and from South Shore Dr. to Greenbay ave (west to east) I left the area. I love the South Shore Country Club pictures I worked there as a busboy. I graduated in 1972 from Bowen HS, my good friend Ricky Kravitz lived on 77th & Paxton. My hangout was Rainbow Beach! I attended W. K. Sullivan elementary on 83rd & Houston. I love your pictures!!! Although I have lived in Calif., since 1983, my home will always be South Chicago!! GO Bowen and the “Boilermakers” Our steel mills made Chicago! Thanks for sharing the photos. Especially the one of the Hamilton Theater, where I was an usher in ’56-’57. Also the Harding museum, and, 5th Army HQ, where my future wife worked in the PX as a teenager. Apparently, we were neighbors, separated more by age I expect. I lived at 7900 Essex and our apartment windows (not sure which floor) faced 79th St. I lived there only 2 years after transferring from HP high school, and then graduated So. Shore in ’58. I left for the Army then and my parents remained in that apartment until about ’65. My wife was a ’54 grad of Bradwell and lived across 77th St. from the Bradwell playground. My wife and I have returned to the neighborhood only during the SSHS reunions. We are glad we didn’t remain there, but it has been interesting to see the transformation over the years. My dad was the sweaty pizza baker. Small deigo , white pants and white t-shirt covered in flour. My sister just told me about this site. Loved that area. Fond memories of walking to Rainbow beach, the handball courts, smelt fishing, the corner store across the street, people snow sliding behind the buses, glass bottles of old dutch and coke a cola. Men playing poker games in the back room, Juke box records playing, pizza pizza pizza mmmmmmmmmmmmm all the wonderful smells. Hey John, I just wanted to thank you for your beautiful pictures. 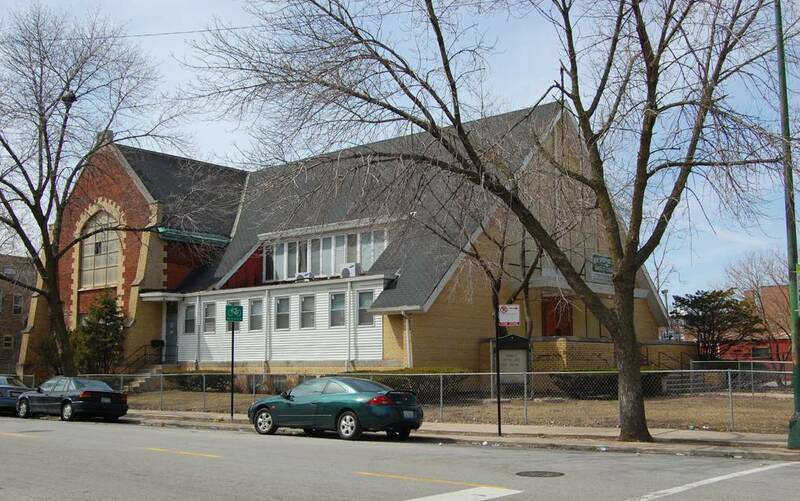 I live on the south side of Chicago near St. Michael’s church. I love photography and preserving my childhood through my photograph’s your work is an inspiration to me. thank you so much. But a generous comment like that could leave me with a swelled head for a good part of the day. Loved this. I grew up in South Shore too. What a trip down Memory Lane. It is very sad. I made my last trip back to South Shore in the 1980s, and what a shock, much like discovering the decaying corpse of an old dear friend. As I’ve said elsewhere on the site, I make it a policy not to use more contemporary images. Lived at 80th & Houston (Just inside the “Bush”)and graduated from St. Brides in 1947. ( Closer to St. Michaels but we didn’t speak Polish) Graduated from Mt. Carmel in 1951 and U of Illinois in spring 1956. Sold newspapers at 75TH & Exchange in front of Walgreens and near the Brown Derby Tavern around the corner. Spent many times at Flarrety’s on 75Th street a half block west of Exchange on North side. Used to play “swift pitching” at Bradwell behind the furnace room. Spent more than a few hours at the Ray Theater for the “B” movies of the era. I believe we saw up to 12 movies a week (features changed 4 times a week and had three movies each time.) Spent many days at Rainbow Beach with the guys at handball and with my future wife Peggy(from St . Felicitis and a graduate of Aquinas in 1955) Still married and going on 56 years and 7 children later! Luckly stumbled an your site while searching for the Avalon Theater history – in it’s glory days as Arabian Nights and LARGE pond in the lobby with live swans at one time. (My memory could be confused with the Southtown lobby also) Theaters were mgnificant at that time and easily available by street car – even “hopping a street car at times and “setting” a trolley line – particulary on the Coles Av turns at 75th & also 179th ST.. For classy movies we would go to the Shore Theater. Once in while the Jeffery or Hamilton and on a mission to thr Stony or Tower on 63rd St. Have great memories of not having any money, but great clean fun!! Be sure to look also at my larger site: http://chuckmanchicagonostalgia.wordpress.com/ which is about Chicago in general. You will find pictures of the Southtown there and many other movie theaters. Just use the search box near the bottom of the page. I also went to St. Bride (class of 1955) but what really struck me about your post was working at the newsstand at 75th and exchange, but the Eastside stand. I used to work on Saturday afternoon and evening “stuffing” the Sunday papers and selling the papers to the locals and the saloon patrons. Sometimes you would get a nickel or dime tip. Big money when you’re 14. Read the small type at top of blog. All non-commercial use is fine, and please cite the source. I am so glad I discovered your photo sites John. Nice work. Clearly a labor of love. I grew up in Roseland and wish you might break out some photos or postcards of Michigan Avenue, the shopping district. Does Gateleys ring any bells? How about Roseland Music Shop? My “Uncle” Hyman Winograd opened and ran that store. In my youth old Uncle Hyman was still there but his savvy son “Buddy” Winograd ran the place. It had a giant “Nipper” the RCA dog, listening to “His Master’s Voice” outside the entry. It had a speaker tucked inside the dog for music to play to the public. My Uncle told me that they used to take crank phonographs in trade on new fangled radios in the ’30’s. How about pics of The Roseland or State Theatres”? Well anyway I am just begging for you to dig up any photos, postcards, or recollections for me. I hope you can. PS – I did got to U-high at U of C and took the IC train every weekday from 107 and Cottage Grove to the 59th street station. I just thought I would throw you a bone with that reference. My family liked to eat at The Tropical Hut, too. At that time one of my schoolmates dad owned and operated it (1966). My father, Marvin Reitman’s career was as a bacteriologist at the Southside Filtration Plant. Did you ever tour that gigantic gorgeous building, HUGE? Remember when McCormick Place burned? I rode the IC train a little farther the next morning so I could see it. Got Pics? My best wishes that you keep busy with your history and thank you for the effort. If I come across images of your Roseland, I will certainly put them up. I do remember the McCormick Place fire. I sometimes thought it might have been deliberate – fires for insurance were pretty common in the Chicago of that time, at least the legends said – because the original building proved something of an architectural monstrosity. A beached whale on the lakeshore. The Miesian replacement seemed a big improvement, but I now think it rather lacks the grace of the designer of Crown Hall’s touch. Your site brought back many memories. I lived on 77th Street the first eighteen years of my life just two blocks west of Myra Bradwell. My father, aunt, two uncles, and sister graduated from Bradwell. I was allowed to leave, with diploma, in 1955 only I believe because my relatives had done so well there, I had not! I much regret that after high school, CVS, I have had only one face to face encounter with anyone from my days in Windsor Park and that was forty-five years ago! Many thanks! Hi, I was looking through your pictures, beautiful job on it. I grew up in South Shore too. I notice your first apartment was on 75th & Colfax, and you mention the Deli on the corner was called Al’s my dad was part owner maybe before or after it was called Al’s but then it was called Bloom’s and my Grandfather had a tailor shop near the alley. My dad was Al. My dad had that store from the early 50s to early 70s. When he closed there was no longer a deli there. The deli was on 75th St, but not on a corner. Oh, I do love getting notes like yours. In my day there was a large billboard on the wall just south of the deli advertising Canfield’s products. Recently, another old South Shorite of my generation, told me of her collecting old metal coat hangers and selling them at the tailor’s to buy treats. I used to collect pop bottles in the alleys for the same reason and often brought them to Al’s. I bought more than a few onion rolls or bagels at the deli. Steve, I ask all who write me whether they have any old snapshots or photos or memorabilia they could scan for me to put on the site. I’d love something which showed the Shore Theater or some other notable places or certainly your father and his store. Have you seen Jeffery Bloom’s comment on the site about the same store? Thanks for your note. The tailor shop and the deli were sure familiar local sights. I used to collect pop bottles in the alleys for the same reason. I’m sorry but I don’t recall your brother’s name. Perhaps you knew my younger brother, Bill? Jeffery, I ask all who write me whether they have any old snapshots or photos or memorabilia they could scan for me to put on the site. I’d love something which showed the Shore Theater or some other notable places. I have just stumbled on this web site and it is bringing back many memories. I grew up at 7641 South Shore Drive 1946-1964 and attended Bradwell and SSHS. I believe that you were one year ahead of me. The comment from Lita Skinder above reminded me that I was good friends with her brother, Steve Skinder. We also attended the same church, south Shore Presbyterian. Do you recall the building to the A frame addition about the mid-50s? I will try to dig out some old photos and send you scans. I do have copies of the Tide yearbook of SSHS 1961-1964 if you would want any photos from them. Hi neighbor! I grew up living at 7926 Kingston. I would cut through the alley to go to White Castle or Albert’s Deli. I remember fondly buying a pickle out of the pickle barrel at Alpert’s when my mother would send me up for a quart of milk. I think they were a nickel. Graduated from St. Brides in 1955 (we’re planning our 60th class reunion next summer) and wound up marrying a girl from 8133 Olgelsby, Carole Daly. We just celebrated our 50th Anniversary. I loved your collection. Most were instantly recognized but I had long forgotten the streetcar down Stony Island. Thanks for stirring up some old brain cells. Hi John…Such wonderful trips down memory lane. I lived on the South Side of Chicago during my youth from Hyde Park ..1945-1953 ( 50th and Drexel ) Jackson Park..1953-1957 (64th and Harper ) South Shore.. 1957-1963 (75th and Kingston..70th and Cregier )..East Side…(105th Avenue G) 1963-Oct.63. IKlawans Drugstore on the Southeast corner of 75th and Kingston. The tailor shop ( Hirshbergers ) on the Southwest side of Kingston, may have been 7504 S. Kingston. I was a delivery boy with bicycle for both of these business’s. Yes, yo yo tournaments on 75th Street, Rainbow Beach ….smelt fishing in the spring…swimming in the summer,,,ice hockey in the winter..Those were the days that I remember, a totally different time compared to today. John, There may be a informal get together for the class of 62 in 2017, kind of like 55 years of passing. If you are able and would like to attend , let me know and I may be able to fill you in on the arrangements if and when they become available. And thank you, Richard, for the thoughtful words. South Shore was a special place, but it was also the time adding to its luster. Truly nothing is the same in half a century, but I suspect people have been saying that for many lifetimes. i recognize your name from this post……i am art wiessner’s dtr toni. my dad owned ray’s pizza and we have been looking everywhere for anyone that might have a picture or two of his pizza place. Chuck, I really appreciate your collection. I grew up in South Shore in the 1960’s and 1970’s, on Chappel, and your collection offers me rare glimpses of what would otherwise be my own imagined past. Your blog is a tremendous gift. Thank you!